We invite people beginning: 5:00PM, 6/19/15, to meet at Rogers Avenue and the Lake and bicycle 2 miles to Indian Boundary Park, 2500 W Lunt Ave, Chicago, IL for a ride and talk. On June 19, 2015 at Indian Boundary Park, Chicago we will hold our launch/performance opening and presentation to kick off a 2 month, 3000 mile landscape project that involves bicycling from Chicago to the Oregon coast. For the next 2 months, my daughter Julia and I will lead various riders on different sections of a cross country expedition investigating issues of landscape, history, and restorative justice. Following the historic routes of Lincoln and Lewis and Clark westward, our journey from Indian Boundary Park Field House will also explore concepts inspired from restorative justice and First Nations and Native American cultures such as the reintegration of stories and histories into our awareness as a means to facilitate healing, balance and harmony amongst ourselves and with our relationship to the environment. While we travel, we will be documenting the stories of people and the landscapes, sharing them via our website, (www.CrossingTheGreatDivide.net) and welcoming a public dialog on these issues locally as well as digitally. 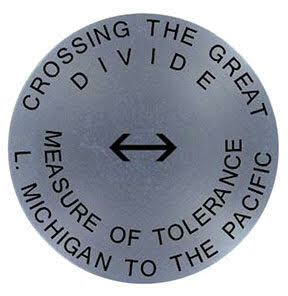 We will be setting survey disks inscribed with the words, ‘Measure of Tolerance, Crossing the Great Divide’. These markers will serve as focal points for crossing a divide that separates us from each other and inscribe a new benchmark for a territory of cultural acceptance and tolerance. During our journey, we will also literally cross the Great Divide of the Rocky Mountains, fracking-mine locations, and Native Reservations. 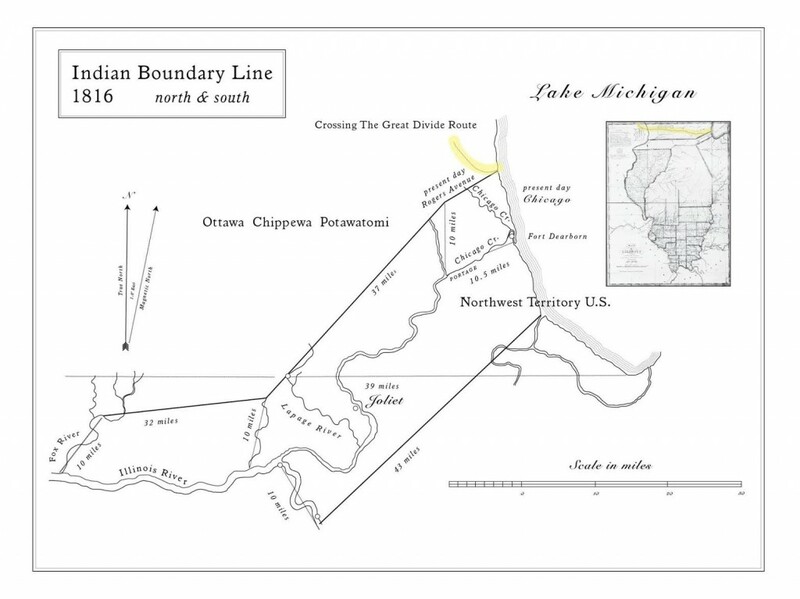 The journey’s launch begins at 5pm with a 2 mile community bicycle ride and talk leaving from Rogers Avenue and the Lake and riding 2miles to Indian Boundary Park (the site of William Clark’s 1816 survey that secured access to Lake Michigan from the Objibwa, Ottawa, and Potawatomie). We will then introduce the historic routes of the area and our path, do a reading, present maps, and discuss our interactive mission with the public and how they can participate. Special thanks goes out to the generous support of Roman Susan Gallery-Chicago, The Rogers Park Arts and Business Alliance, The Peterson Garden Project, Perimeter Gallery-Chicago, and the Chicago Park District. Our journey map and statement can be viewed at www.CrossingTheGreatDivide.net. Our blog will be live 6/20/15. I am anxiously waiting for the journey to begin! One week from today and the journey begins on the frontier! What an amazing adventure! Looking forward to sharing it with you along the way. God’s Blessings on your trip and all the wonderful people you will meet and all the places you will see. Nora, Thanks for the note as we ride into the known and unknown.